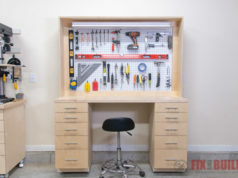 Do you have a small workshop with limited space? 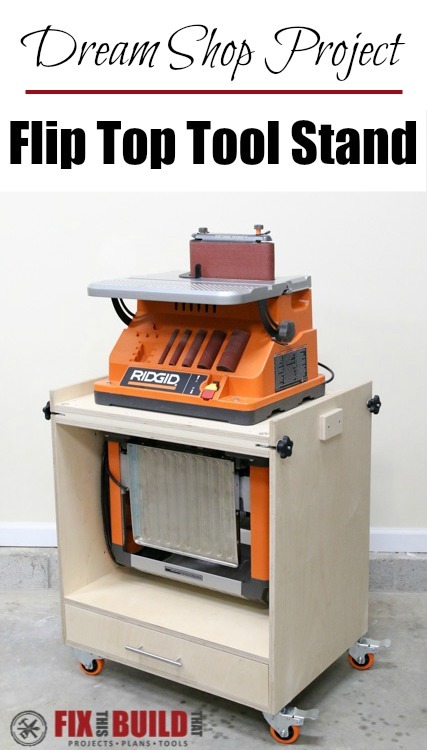 Want more benchtop tools,but don’t know where to put them? 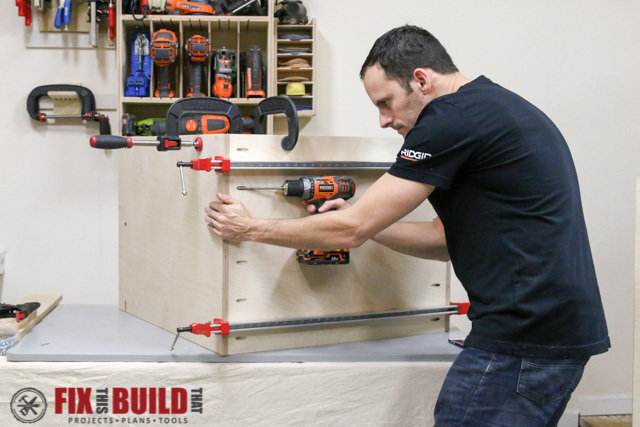 Today I’m going to show you how to build a flip top tool stand that is a great project to make your garage or basement workshop work harder for you. I’ve got full build details below and plans are available for download. 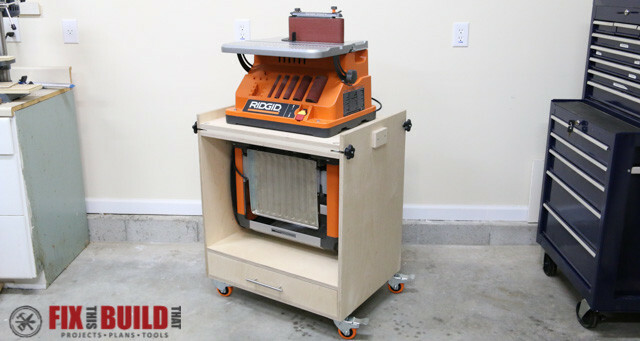 This workstation pulls double duty with a portable planer and spindle sander all in one footprint. 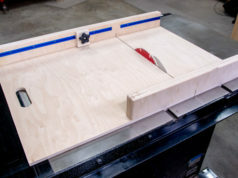 Instead of lugging tools from under your workbench onto a table, you can easily access either tool in a matter of seconds. 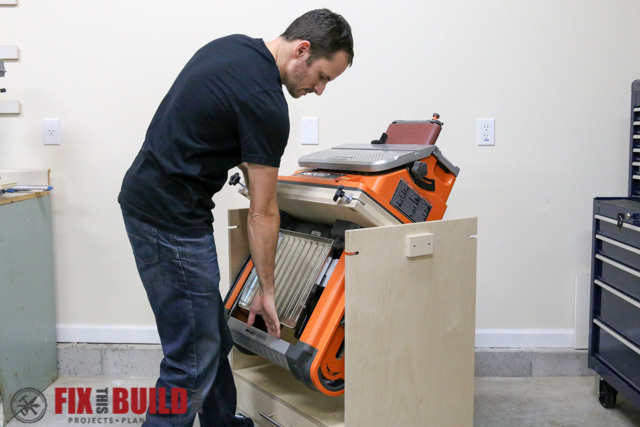 This rotating tool cart gives you extra storage and ease of use all in one. I originally saw this idea of a flipping stand in Shop Notes Small Shop Solutions. I used that idea and made my own version with simple joinery, beefy and easy to install rotating parts and added some storage to boot. And you can make it out of just one sheet of plywood! 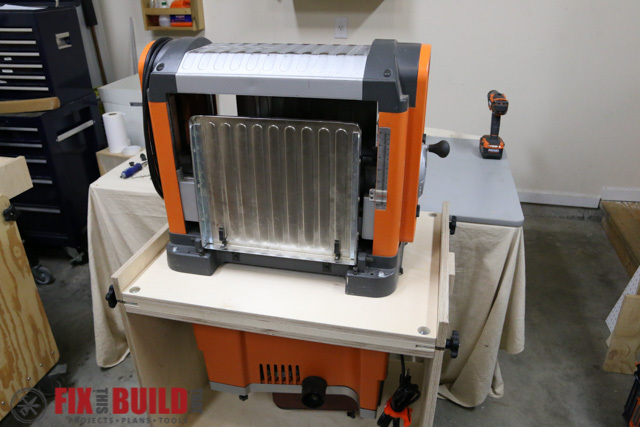 I’ve partnered with RIDGID Power Tools for this build and made my flip top tool stand to fit an older RIDGID TP13002 planer (the newer model is the R4331) and the current model RIDGID EB4424 Oscillating Spindle Sander. 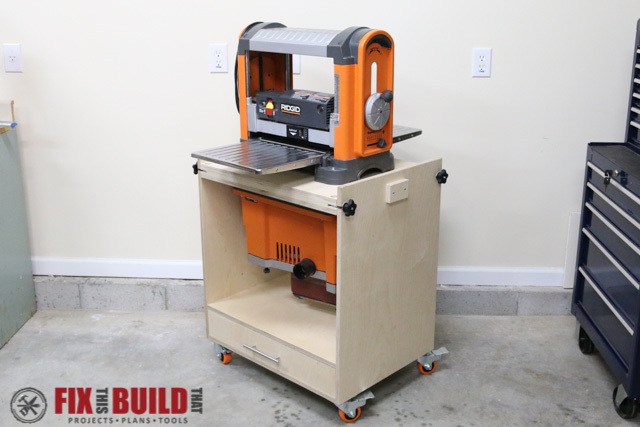 My planer stands 20″ tall and is 26″ wide. If your planer is larger than this you will need to adjust the plans accordingly to make the sides higher or the shelves wider. 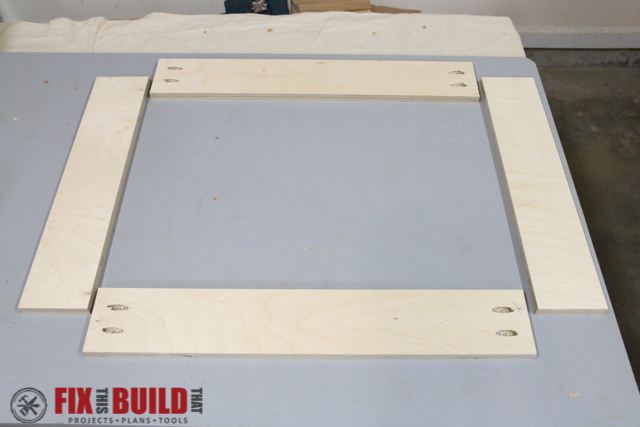 Start by breaking down the sheet of 3/4″ plywood into 3 sections. 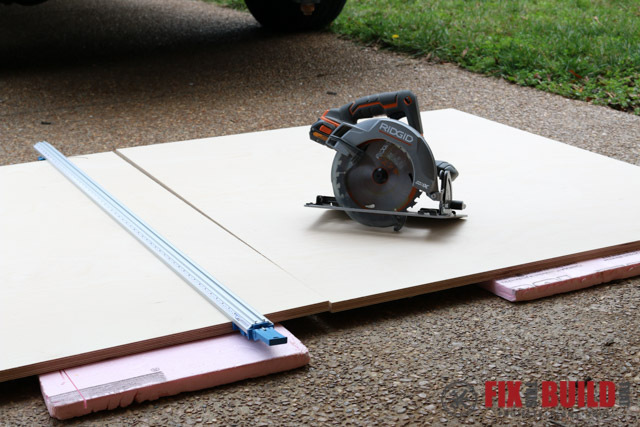 I used my RIDGID cordless circular saw and cut the sheet in my driveway. 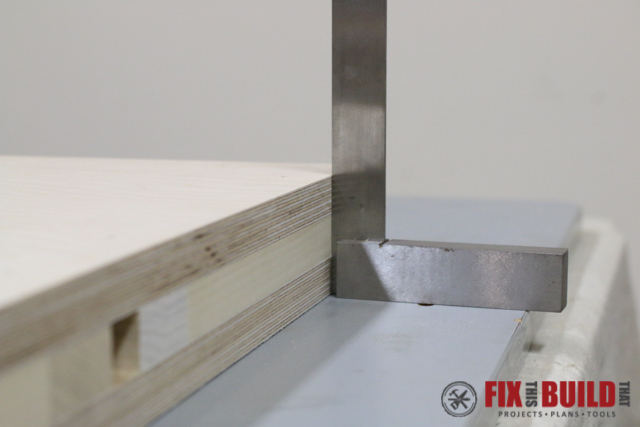 With a straight edge clamp and the ply set on some 1″ foam insulation it’s a breeze to cut down the sheets and have manageable pieces to work with. 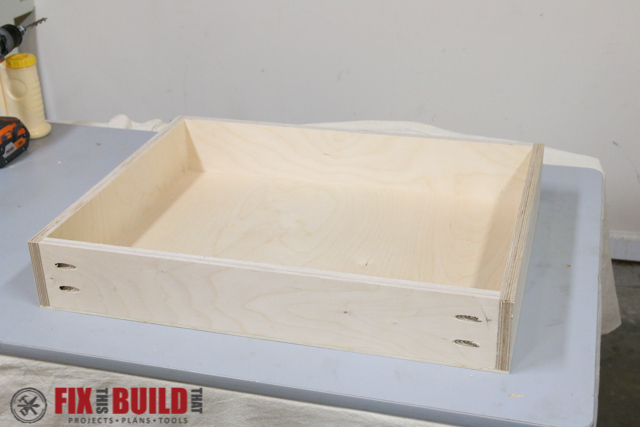 The base is made from 2 sides at 30″ x 21-1/2″ and a bottom and shelf at 27″ x 21-1/2″. 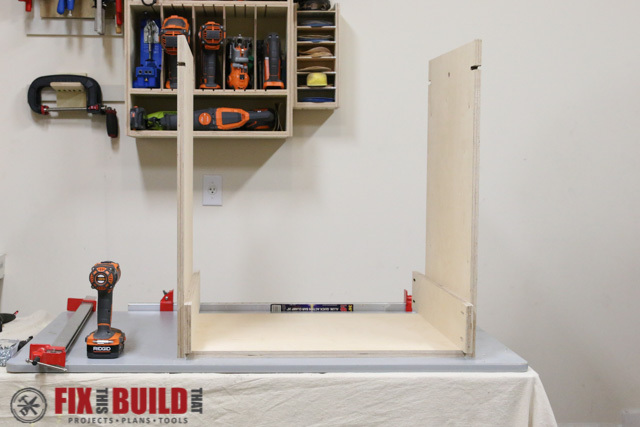 Cut the sides, bottom and shelf to size and drill pocket holes in the underside of the bottom and shelf to attach to the sides. The sides have slots and holes in them to allow the flip top to spin and lock. 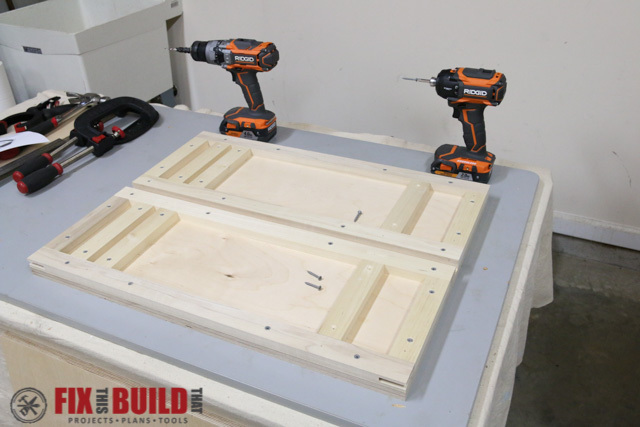 Clamp the sides together and drill a 3/4″ hole through both sheets centered on the sides 2-5/8″down from the top. I used a block with a 3/4″ hole in it that I drilled on the drill press. This helps keep the bit straight as you are going through the pieces. 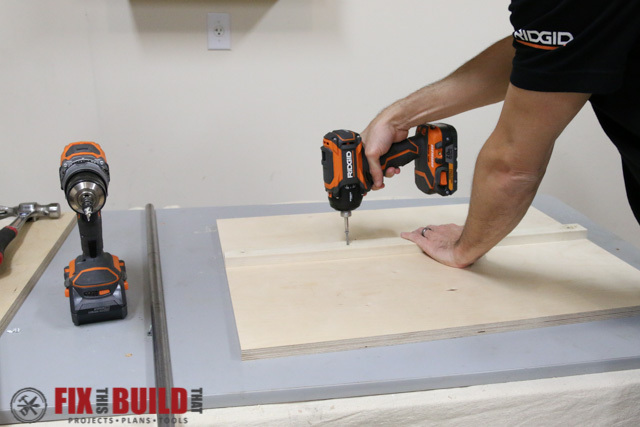 After drilling, put the 3/4″ steel rod through the holes and ensure they are straight and true, adjust as necessary. Round over the edges of the side with a small roundover bit in a compact router. Next cut 2 slots in each side for the flip top locking hardware. They are 3/8″ wide, 1-1/2″ long and 2-5/8″down from the top. 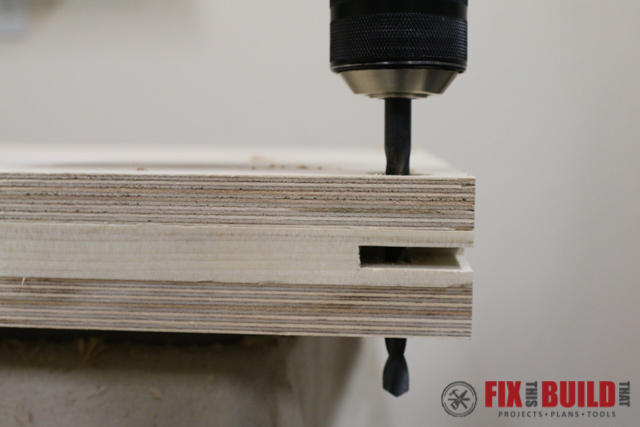 Use a 3/8″ straight bit in a router and take 3 passes removing 1/4″ of depth each time. 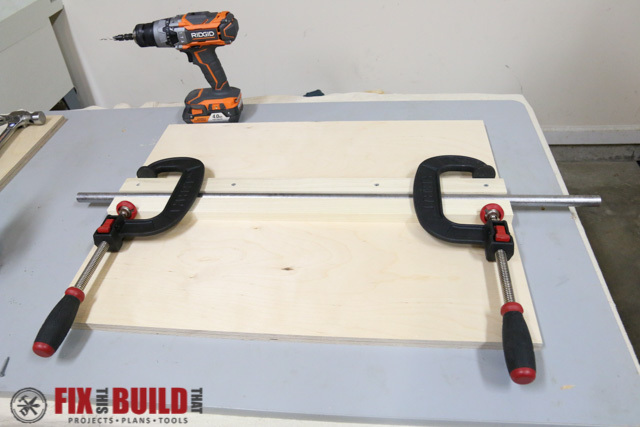 Clamp the sides and bottom together with the locking slots and 3/4″ hole away from the bottom. 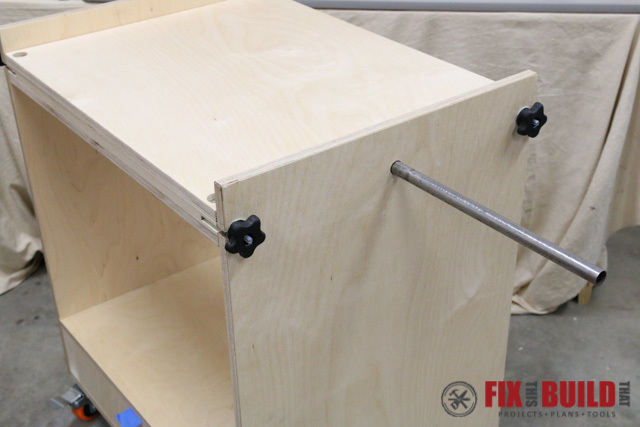 Attach the bottom with 1-1/4″ pocket screws. 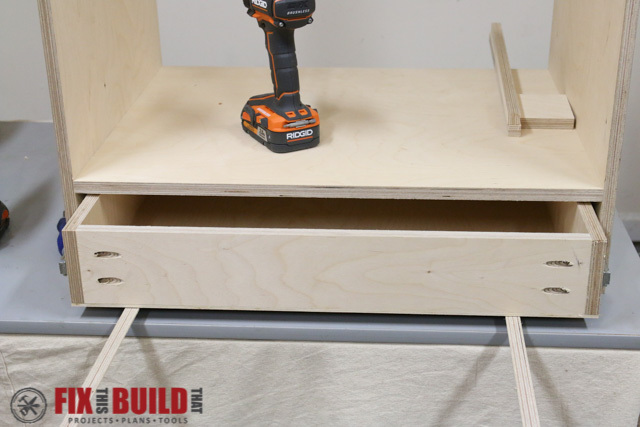 Set the base upright and put the shelf in place on top of 4-1/2″ spacers resting on the bottom. 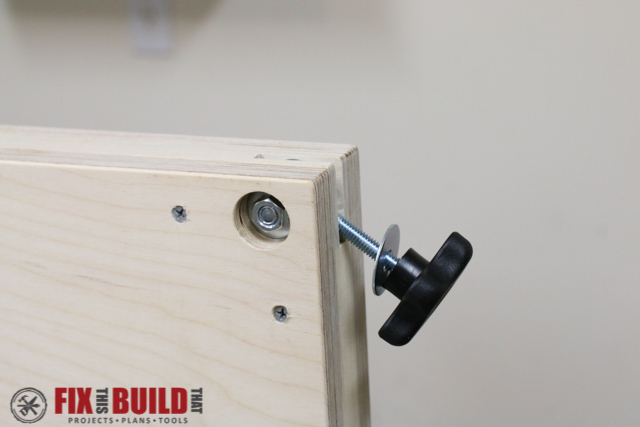 Clamp the shelf and attach it to the sides with 1-1/4″ pocket screws. 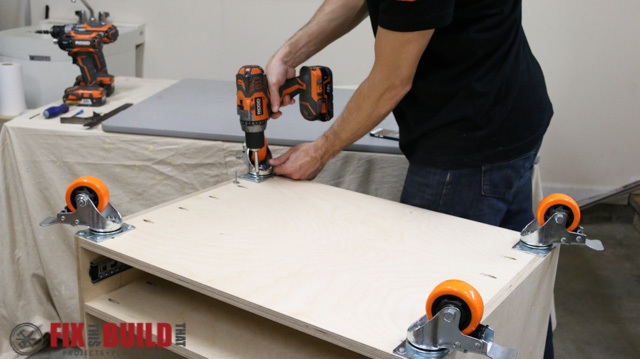 Cut a shelf back to 27″ x 4-1/2″ and drill two pocket holes on each end. Clamp the shelf back in place under the shelf, flush with the back. 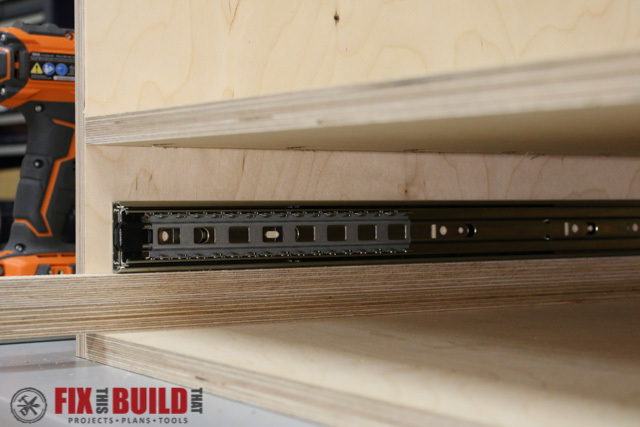 Reach under the shelf and secure it to the sides with two 1-1/4″ pocket screws on each end. I used 20″ full extension drawer slides for the drawer. If you are using another type of drawer hardware than adjust measurements as necessary. 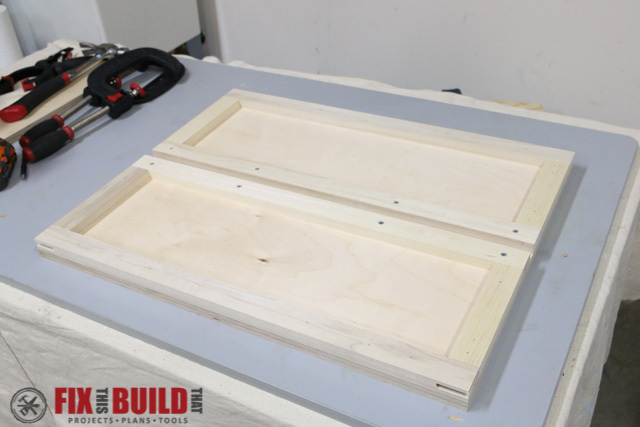 Cut 2 sides to 20″ x 4″ and a front and back to 24-1/2″ x 4″. Drill pocket holes on each end of the front and back pieces. Note, I used the sides as my spacers when mounting the shelf by cutting them first at 4-1/2″ and then cutting them down to 4″ at this point. 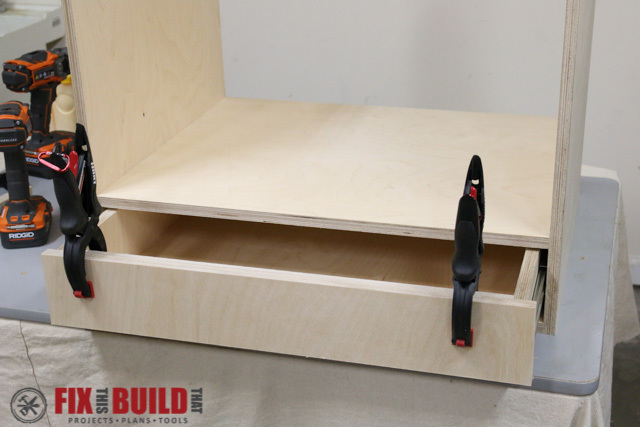 Clamp the drawer pieces together with the pocket holes on the outside of the drawer. Connect the pieces with 1-1/4″ pocket screws. 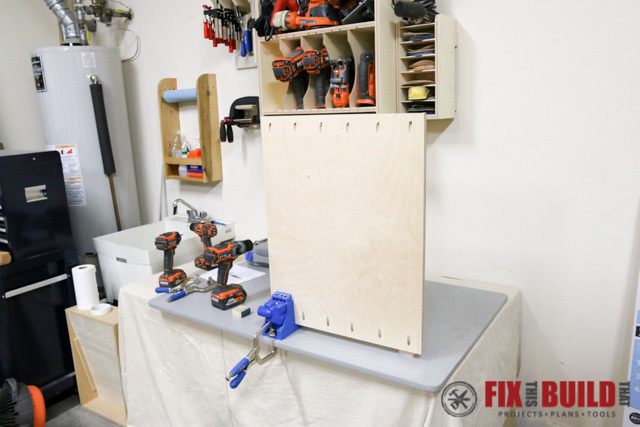 Cut a drawer bottom out of 1/4″ plywood to 26″ x 20″. 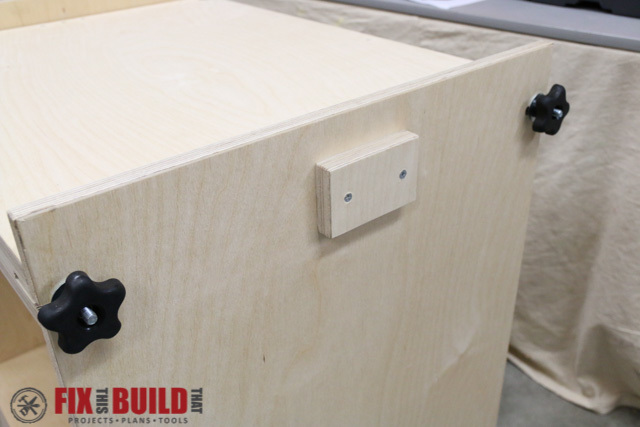 Square the drawers and secure the bottom with glue and a brad nailer or stapler. 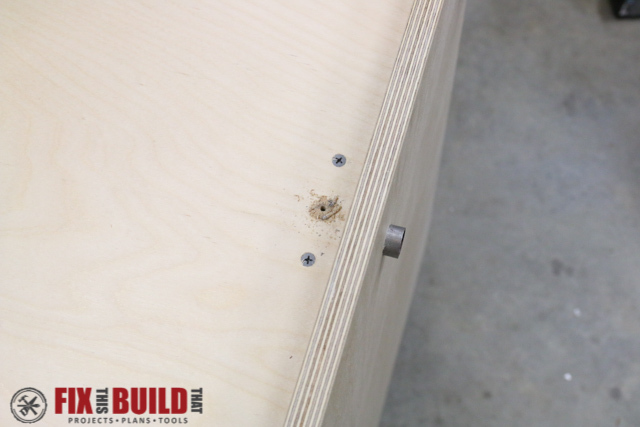 Install the drawer slide hardware to the sides using a 1-1/2″ spacer to hold the slide level. 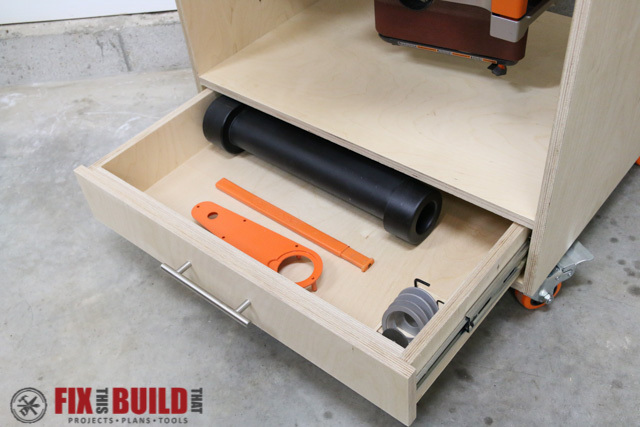 Put 1/8″ spacers on the bottom of the tool stand to position the drawer and then secure the slides to the drawer. 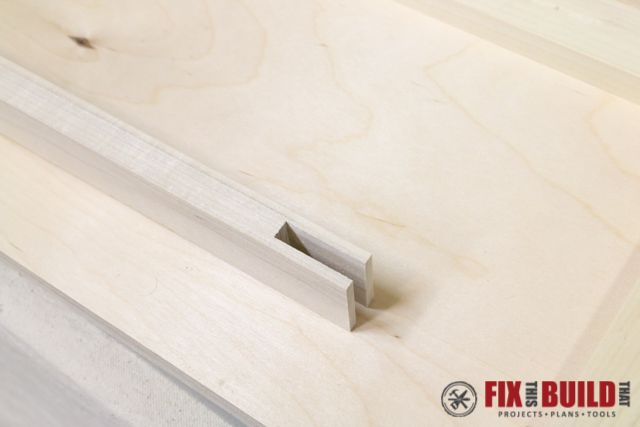 Cut a false front for the drawer to 26-7/8″ x 4-3/8″. 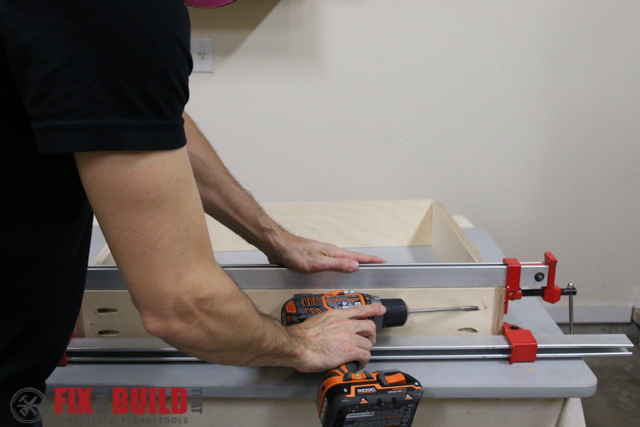 Drill two 1/4″ holes through the actual drawer front for attaching the false front. 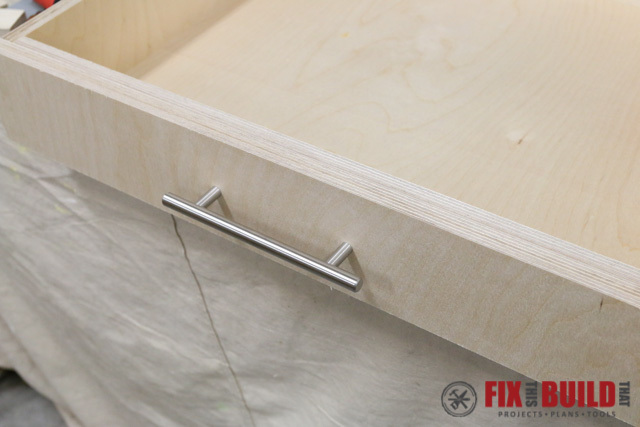 Clamp the false front to the drawer and secure it with 1-1/4″ pocket screws. 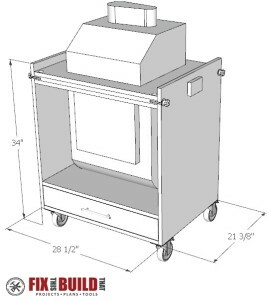 Using the 1/4″ holes in the drawer will allow you to adjust the false front to get a consistent 1/16″ reveal all the way around. Attach drawer pull hardware as desired. I used a 5″ bar style pull. Turn the flip top tool stand upside down and attach casters. 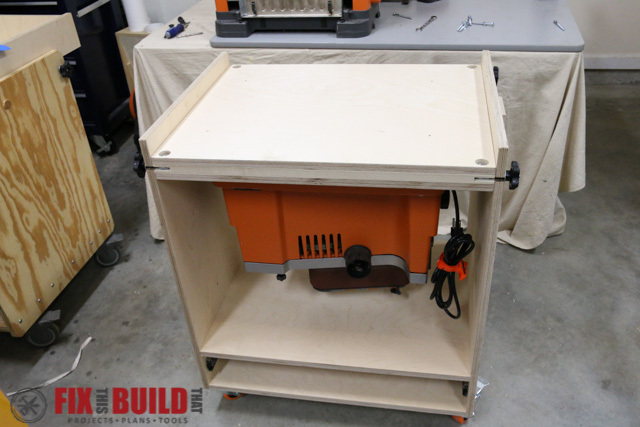 I used 3″ double locking casters for this build. 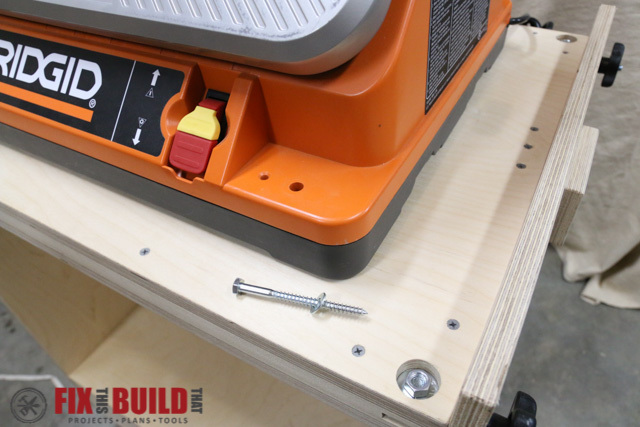 Secure with 1-1/4″ screws into the sides and shelf back and 3/4″ screws into the bottom. 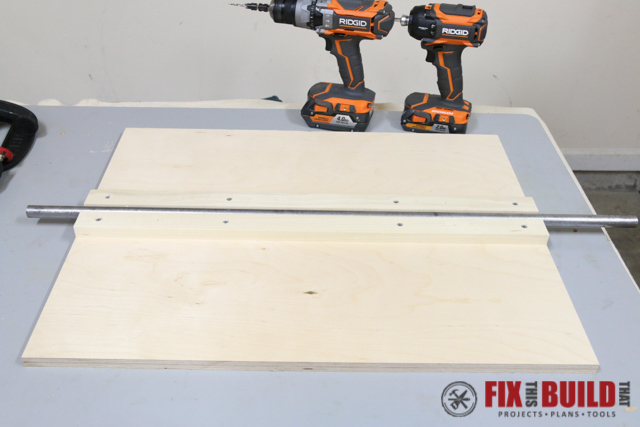 Cut 2 pieces of 3/4″ plywood to 27″ x 21-1/2″ and 4 pieces of 1×2 to 27″. 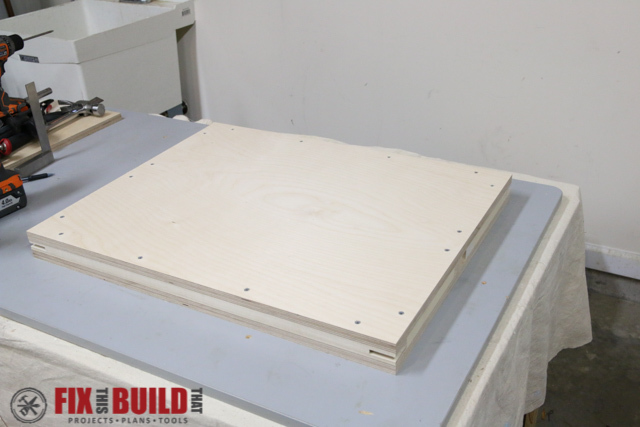 On one top piece layout a 3/4″ wide section that runs 27″ across the center of the top, this will be where the steel rod goes. Fasten down one 1×2 on the edge of the 3/4″ outline with 1-1/4″ screws. Countersink these and all screws from here on out. Add another 27″ 1×2 on the other side and place the 3/4″ pipe between them. Clamp the boards and the pipe together and secure the 1×2 with screws. This will give a tight fit for the pipe later. 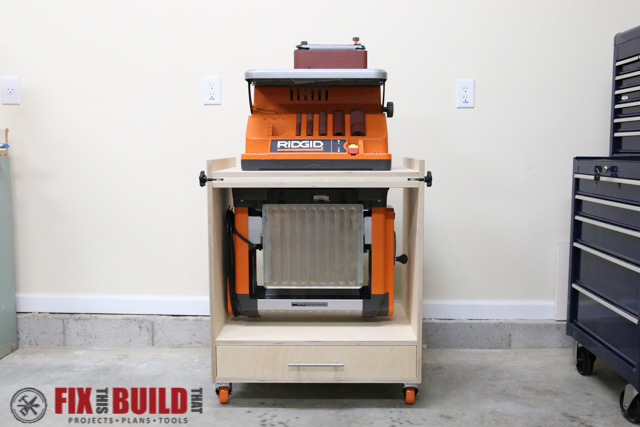 The other two 27″ 1×2’s will house the locking hardware for the flip top tool cart. 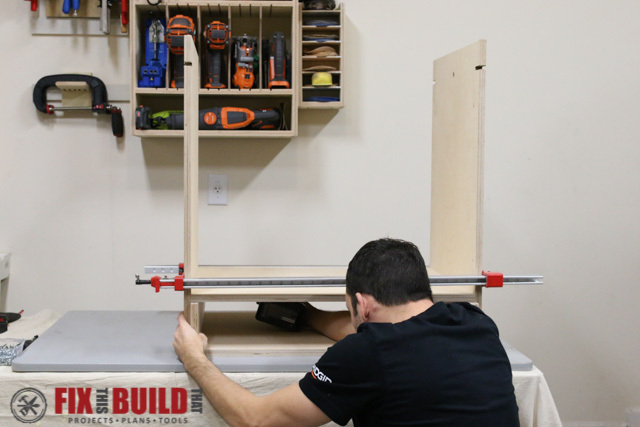 Cut 5/16″ wide open mortises 1-1/2″ deep on the end of each 1×2. Have the eyebolts on hand and test fit to make sure they fit in the slot. 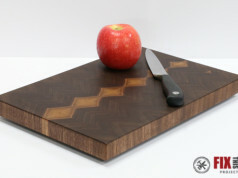 This can be done with a handsaw and chisel or on the tablesaw. Cut 4 pieces of 1×2 blocking 7-3/8″ long. I used my Mobile Miter Saw Station for these cuts. If you’d like to make one of your own there are plans available for this build as well. Line up the short blocking pieces along the edges of the top and secure with screws. 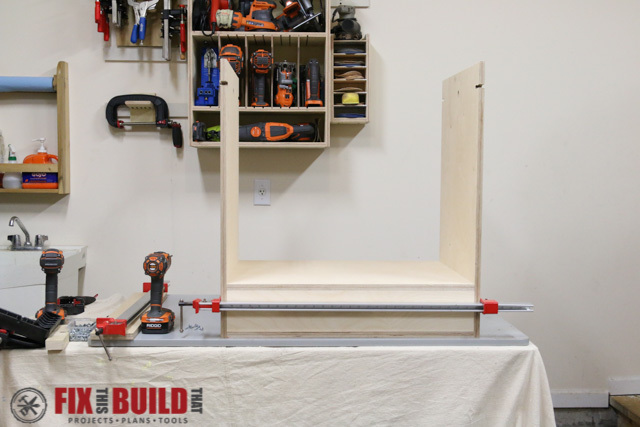 Attach the long blocking pieces with the open mortises along the front and back of the top. This will form two rectangles on the top. 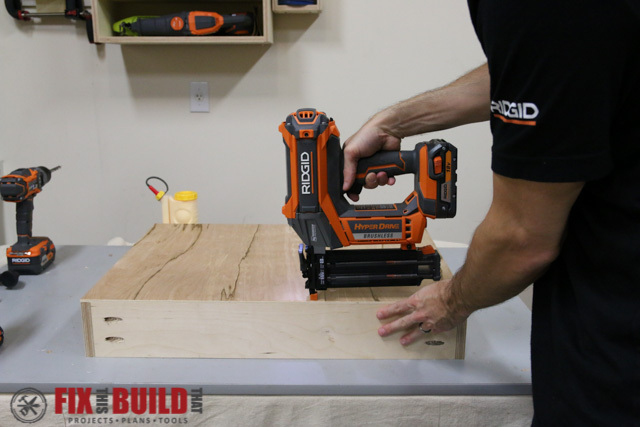 At this point you’ll want to layout your tools that you’ll be attaching to the top and find where the mounting holes are on the tools. 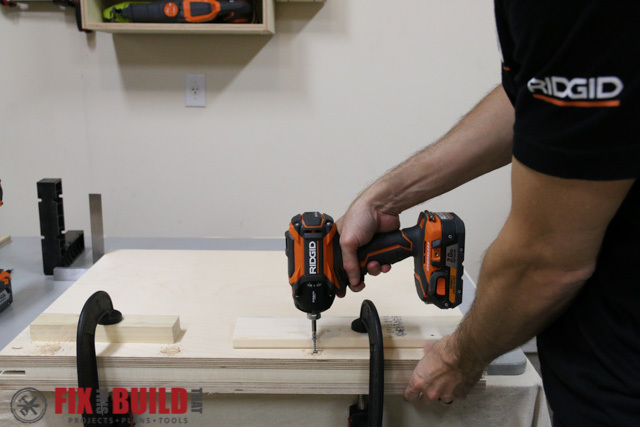 Cut more 7-3/8″ short block pieces and position them where the lag screws for mounting the tools will hit. I used 6 pieces of blocking for this. The pieces on the right of the picture will actually receive the lag screws from both the sander and the planer. The pieces on the far left will receive just the screws from the planer, and the pieces just next to that will receive the sander screws. After all of the blocking is secured, place the second 27″ x 21-1/2″ top piece over the blocking. Line up the edges very carefully here and check them with a square. 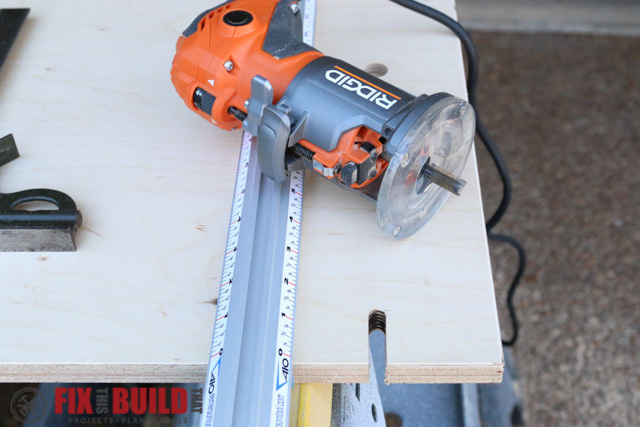 Clamp the whole top together to make sure it doesn’t move and secure with 1-1/2″ screws around the perimeter. It’s a good idea to check where you placed the screws underneath so you don’t hit a screw in the blocking while attaching the second top piece. 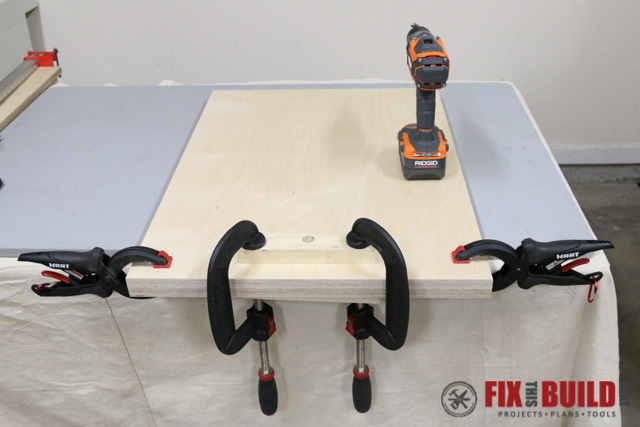 The locking hardware for the flip top tool cart is made up of 7 pieces. A 3-1/4″ long 5/16″ eyebolt with 5/16″ fender washer and 5/16″ star knob are held in place by a 1-1/2″” long 3/8″ hex bolt with two 3/8″ washers and a 3/8″ nut. This design idea came from a Shop Notes build for many years back. On each corner and each side, layout a mark that is 1″ from the closest side and 3/4″ from the front/back (whichever is closest). 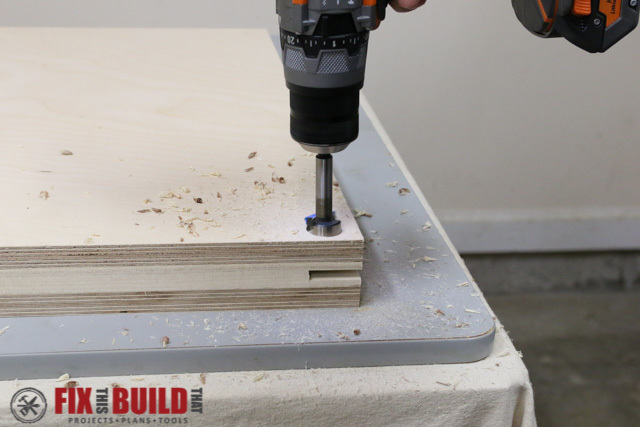 Use a 1″ forstner or spade bit and drill a 1/2″ deep hole at each spot, 8 holes in total. 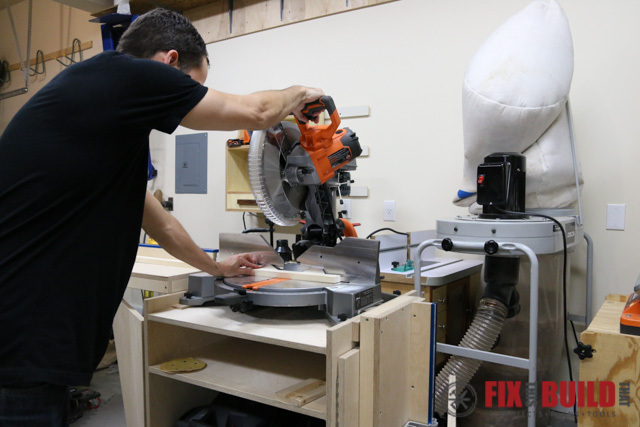 Now go back with a 3/8″ twist bit and drill a hole through the entire top centered in the holes you just drilled. Install the locking hardware in each corner. Use loctite or nail polish on the 3/8″ bolt to hold the 3/8″ nut in place. Here is the part you’ve been waiting for! 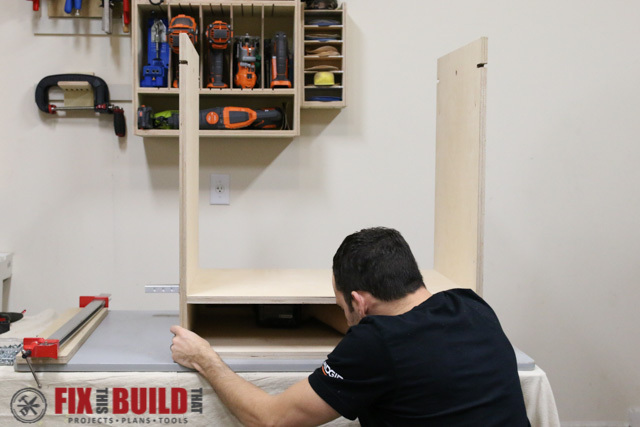 With a helper, install the top on the base with the locking hardware. Line up the pipe chase in the top with the 3/4″ holes on the sides. Use a mallet to drive the 3/4″ steel pipe through the top. 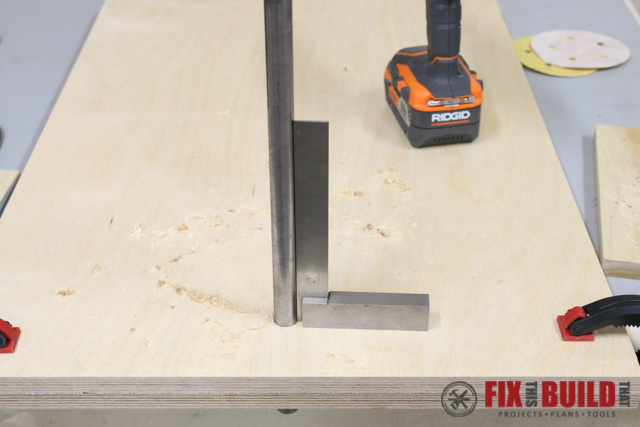 Cut the rod so that there is 3/8″ of rod sticking out of each side, should be 29-1/4″. This will give the pipe and top more support. Center the rod so it sticks out the same on each side (3/8″). 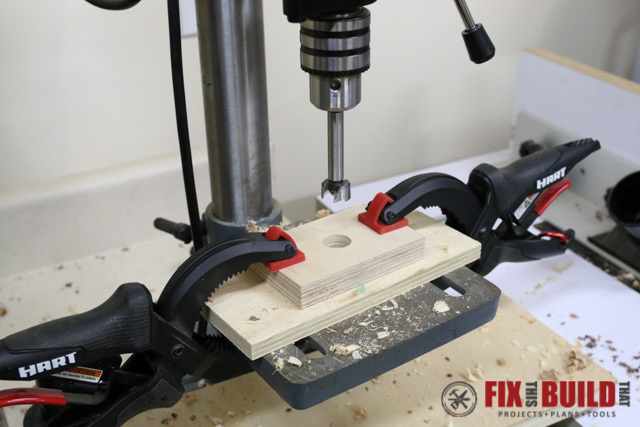 Drill a 1/8″ hole through the top and through the top of the pipe. 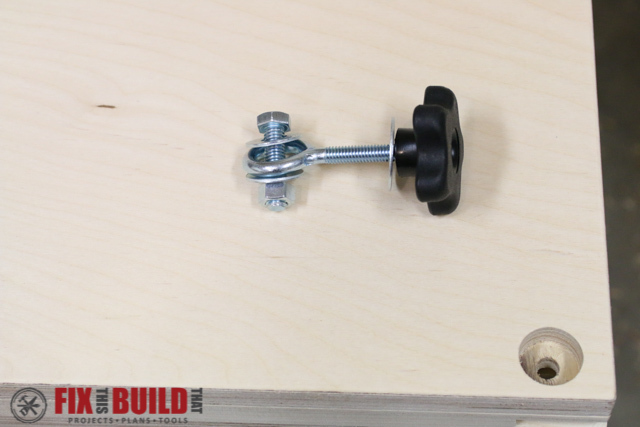 Countersink the hole and secure the pipe with a 1-1/4″ screw. To cover and support the pipe sticking out, cut a pair of 4″ x 2-1/2″ pipe blocks out of 3/4″ ply. 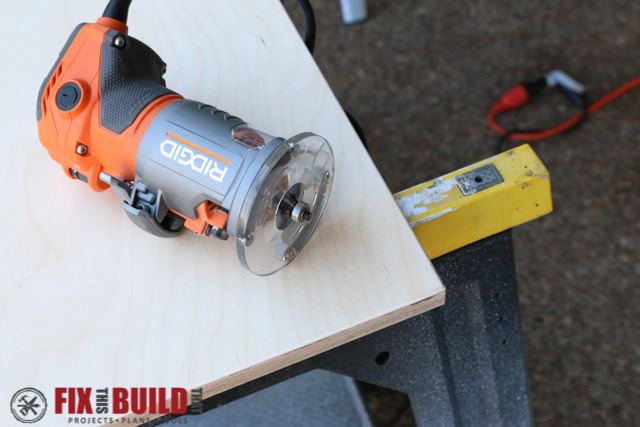 Round the edges and drill a 3/4″ hole 1/2″ deep in the center of each block. Put the blocks over the pipe and secure them to the side with 2 screws. 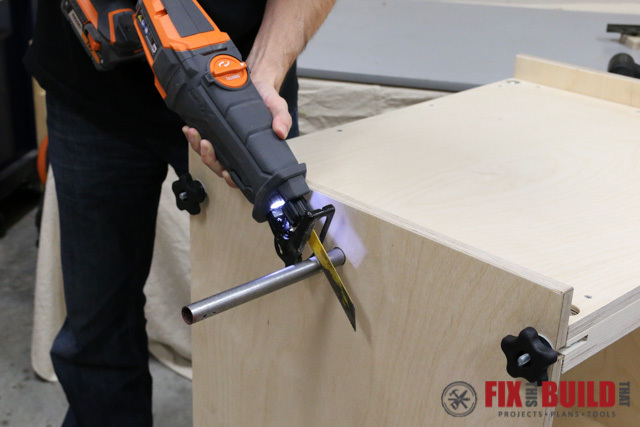 Positions and secure your tools with lag screws. I used 3-1/2″ lag screws and washers to mount each of my tools. 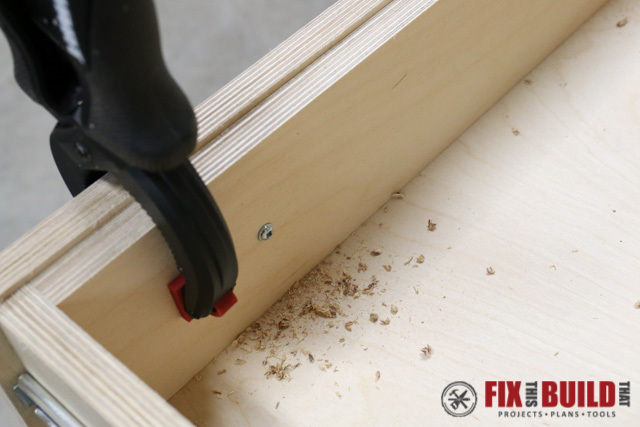 Adjust your screw length as needed to go through at least 2 layers of plywood. Mount the lighter tool first and the heavier tool second. 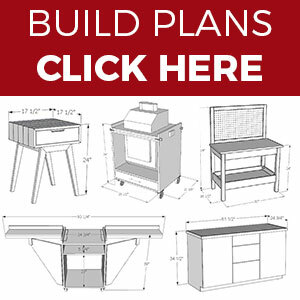 If you want to build other great shop projects to organize your workshop then go checkout my Shop Projects page. 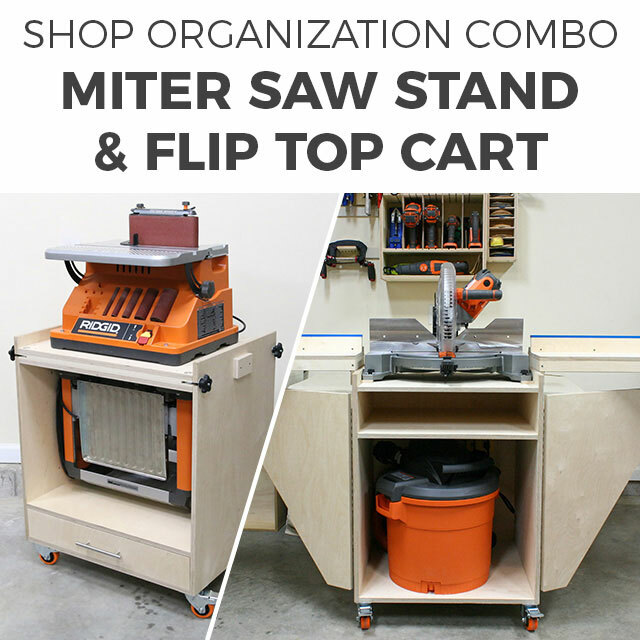 Leave a comment below with what tools you’ll use on this Flip Top Tool Stand and how it will change your shop!